This investigation demonstrated potential detrimental side effects of glyphosate on plant growth and micronutrient (Mn, Zn) status of a glyphosate-resistant (GR) soybean variety (Glycine max cv. Valiosa), which were found to be highly dependent on the selected growth conditions. In hydroponic experiments with sufficient Mn supply [0.5 μM], the GR cv. Valiosa produced similar plant biomass, root length and number of lateral roots in the control treatment without glyphosate as compared to its non-GR parental line cv. Conquista. However, this was associated with 50% lower Mn shoot concentrations in cv. Conquista, suggesting a higher Mn demand of the transgenic cv. Valiosa under the selected growth conditions. Glyphosate application significantly inhibited root biomass production, root elongation, and lateral root formation of the GR line, associated with a 50% reduction of Mn shoot concentrations. Interestingly, no comparable effects were detectable at low Mn supply [0.1 μM]. This may indicate Mn-dependent differences in the intracellular transformation of glyphosate to the toxic metabolite aminomethylphosphonic acid (AMPA) in the two isolines. 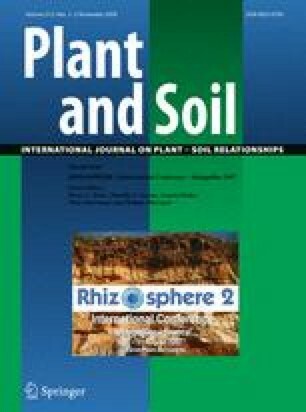 In soil culture experiments conducted on a calcareous loess sub-soil of a Luvisol (pH 7.6) and a highly weathered Arenosol (pH 4.5), shoot biomass production and Zn leaf concentrations of the GR-variety were affected by glyphosate applications on the Arenosol but not on the calcareous Loess sub-soil. Analysis of micronutrient levels in high and low molecular weight (LMW) fractions (80% ethanol extracts) of young leaves revealed no indications for internal immobilization of micronutrients (Mn, Zn, Fe) by excessive complexation with glyphosate in the LMW phase.